I stood on Sunday morning, and among many others, bid farewell to a lifelong friend, who died last Shabbat at the age of 34, after a three-year battle with lung and stomach cancer. 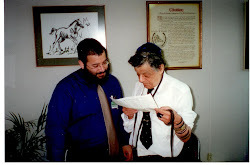 Rabbi Levi Yitzchak Deitsch was Chabad’s ambassador to Tyson’s Corner, Virginia, where he and his wife Miriam built a remarkable Jewish center and led a vibrant community. Levi is survived by his wife, four children, his mother, siblings, and many grieving family members and friends. I had known Levi for many years. Among other things, we shared a passion for unhealthy, delicious kosher food. He loved people; he knew how to celebrate life to the fullest, and possessed a heart of gold. His passion was to help people, never allowing awkwardness or fear to stifle that insatiable zest for giving. His laugh was contagious, his wittiness charming, and his people’s skills impressive. I have always appreciated these qualities in him, but—as I came to realize—I never recognized who Levi truly was. Then he was struck with a terrible illness. During the last three years, I traveled numerous times to Virginia to visit Levi. There I encountered a new dimension to him—an unwavering courage and faith. I took a trip to his hospital bed just a few days before his passing. He was physically drained, receiving oxygen, his body tormented from years of a ravaging illness. But he still had that glitter in his eye, that spark of life. He said to me these words: I will overcome! Doctors kept on saying he had a few days left. Each time, he surprised them. Yet at the end, G-d decided to take him. The miracle did not happen. And then I realized: Levi himself—he was the miracle. He did not let go, and in the process, all of us were blessed. Farewell my dear friend. With your life, we have all been enriched and blessed; with your passing, we are impoverished. I will miss you Levi.